Legends Museum | Ray Price, Inc. This is a hallmark to one family's dream and a benchmark for Harley-Davidson®. Our Drag Racing Museum is open to the public during our store hours, located on the upper balcony of our main showroom. As we often say in the Harley world, it's not the destination, it's the journey. This journey goes down memory lane—down the hundreds of quarter-mile and eighth-mile tracks. You'll meet some of the drag racers who have smoked the tires, made a perfect launch, got a great reaction time and set a new record. You'll also meet some of the thousands who didn't set a new record but became a hero to their friends for trying and had a great time. The first drag racer inducted into the Sturgis Motorcycle Hall of Fame had almost retired this elegant Knucklehead gone Nitro. Hill made a special effort to fire up the Knuckle. Its distinctive pop-pop-pop brought tears to nitro fans in attendance at the annual Ray Price Winter Open House (and it wasn't just the nitro fumes). 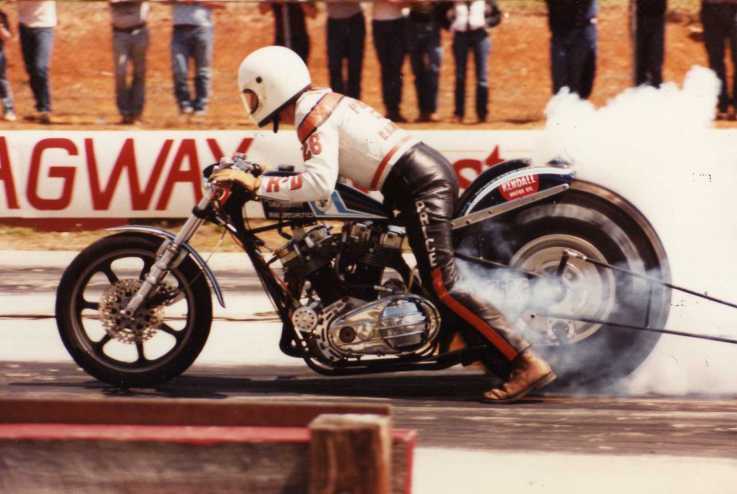 Price was an inducted member of four halls of fame including the AMA Hall of Fame, National Motorcycle Hall of Fame, Sturgis Motorcycle Hall of Fame, North Carolina Drag Racing Hall of Fame, and the East Coast Drag Times Hall of Fame; and is noted as the Father of the Funnybike. He was instrumental in creating the current style racing transmission. Price also designed the first successful wheelie bar for bikes, allowing more power to the rear wheel without flipping the bike over. McClure began drag racing on asphalt as a direct result of watching Ray Price compete in the late '70s. Coming from the dirt drags, McClure is a 19-time National Champion and has held more records than he can keep up with. "Pearshape" represents the early Midwestern drag racing efforts. He raced through the mid and late '50s with the Kansas City Chainstretchers. Russell was instrumental in introducing the Top Fuel Harley Racers Association to the IHRA. Both Russell and owner Dennis Paul race at multiple sanctioned events each year. Hard working, devoted to family and sport, are all characteristics that spring quickly to mind. The Mattiolis personify the inner spirit of racing. Tony and Colleen Mattioli are truly a great team and champions in every way. North Carolina native turned drag racer, Turner had served as "hired gun" for several teams including Ray Price Racing before settling in with Richmond-based Team Bulldog's Bobby Buckley, Scott Buckley, Danny Lowe, and Bobby Page. Turner is the '99 IHRA Screamin' Eagle Nitro Harley Champion.